Please use the official template that's provided. That's what it's there for, after all. As for personality and history, there needs to be a lot more depth. It's a bit plain and basic right now, although the potential is definitely there. There must be a lot more to Mira's life in her eleven years of age. You've also provided nothing about the Squirtle, which is mandatory. Again, please use the template and it should help you out. Ok, sounds good. Um, not to be lazy, but can you provide an example of a good and valid trainer application? Thanks! I'd appreciate it. There are my own in the signatures, plus Wolfie's and Ava's. I'd refer you to Slowpoke's as well; Miles, Darkrai and Mitsuki both have great trainer apps. Those are the ones I can think of off the top of my head. I like the application so far but there's also plenty of room for improvement. Why didn't she like the luxurious lifestyle? How did the accident affect her psychologically (and also losing her bike)? What about moving to a foreign region with a different culture? Where did she get Squirtle from? Keep in mind that this Mienfoo can't be used as an extra Pokemon on a first time application. All first Pokemon do get an egg and TM move as an addition, mind. As for the personality, I'd also like a lot more depth. There's some of her traits, likes and dislikes on there but there's no real depth explored as to who she is and what she's really like. Characters, as all people are, should be deep, three dimensional and well-rounded with fears, flaws, strengths and all. Liking the app so far, though. Mira is described as quiet, almost to the point of unsocial. Never ever being able to go to school or playing with other children was how Mira lived her life. Her parents were once famous Poke-vision stars at Unova, so Mira was often lectured indoors about cameras, script, perfect grammar. Mira often got bored immediately, so she'd never pay much attention, leading her to be very clumsy, and not very smart. When her parents finally got her a bike though, she completely changed. The first glimpse of the outdoors made Mira develop certain mental illnesses. The bike however, was supposed to help Mira get used to working Poke-vision videos outside, but she became completely traumatized. She refused to go outside at any cost. She wouldn't talk to any of her family members, which made her very lonely almost every day. It all changed though. She was forced to take special tutoring to help her get her fear away. Finally, she was able to ride a bike, and not worry what was in her way. She finally had an open mind to what she faced. She for once felt free. Unfortunately, this led to more hate to her parents. After she regained confidence, she would often blame her parents. She blamed them for keeping her in the house for so long. She blamed them for her fears, for her loneliness, and soon enough, it turned into rage. Her brother, Chance (4 3/4) never helped her during her moments of rage. She was also blaming him for never being there for her when she needed comfort, so she rode away on her bike, to Lavender Town. Overall, Mira changed deeply throughout her years of being around. She is widely known to be shy and quiet, but she has her moments of anger, and distress. She still hasn't adapted to talking face to face to many people, but she does have some friends. She is usually upset, or fretful at night. She often cries herself to sleep because of the wasted times she should have been socializing, and knowing the world that spins around, but she still needs to get her mind straight in order to move with it. Mira doesn't like battling, especially when she sees her Pokemon hurt. When she does though, she likes to battle very offensively. She doesn't like to spend money on potions, and she doesn't like lowering an opponents' stats. She prefers hitting an opponent as much as she can, even if she is at a disadvantage. Mira was born at Vermillion City to Ari and Vincent Klosse on a very sunny day. Her mother and father ended their career as famous Television Stars to devote their whole lives raising Mira. Since they weren't doing Poke-vision at the time, they decided to teach young Mira how to move and groove while having fun on stage! Mira became easily distracted, and never tried to put effort into this "forced dream". At the time, Mira was often stuck in the house, bored and lonely, so she never knew the wonders of the outside. She had heard tales from her mother that there were vicious Pokemon that would gobble her up in a second. Mira never left the house after those tales. She never went to school, fearing that a Pokemon would stop her halfway and make her into a stew. She never played outside, thinking a giant Wailord would take her friends and herself away. It all changed when she was 6. She finally got a bike from her parents, which was supposed to help her, but made her fear increase even more. When she first tried to ride the bike, she fell. After that, she never wanted to go back outside. It took special tutoring from nearby teachers to get her fears away. In the meantime, her parents were taking care of her new baby brother, Chance Birch Klosse. He never talked to Mira either, thinking she was crazy that she never played or spent time with him. Anyway, Mira finally blossomed. The bike was her luxury. She loved seeing new things like Spearows and Pidgeys flying through the sky. Her hate grew though. She once got so mad at her parents and Chance, she rode away in the middle of the night. She explained to them that they were the reason why she hated the outdoors, and why she never wanted to talk to them. She rode her bike to Lavender Town in the middle of the night. She couldn't see, so she tripped over a Poliwag, and flew off her bike. She landed head first into a bush, but then thrust forward, hitting her back severely to a wall.She was unconscious until the following day, when she was sent to the hospital after being found by an old chicken coop. The experience for Mira was very life-threatening. After just being cured of her fears of the outside, she had another challenge to overcome. With the over-whelming surgeries she had, she was where she was again. Stranded. Lonely. Her parents had only one hope. They sold the bike, saddened by the fact that it did not meet their standards. When Mira found out, she felt another moment of hate. She wanted her bike back, but with it gone, it left her often screaming and destroying things in her room. Not only that, but her brother was already becoming an internet sensation. Chance already had one Poke-vision video with 500,000 views. Mira grew jealous, leaving her in a hopeless pit of failure and disaster. Her parents hated to see her child in distress, so they planned a personal trip for her to Unova. At first, Mira began to hate it. She hated the breathtaking seashores, and the new Pokemon seen in the grass and sky. After a few days though, it changed. seeing the Pokemon made her feel a sense of pride. She wanted to see more, she wanted to discover. 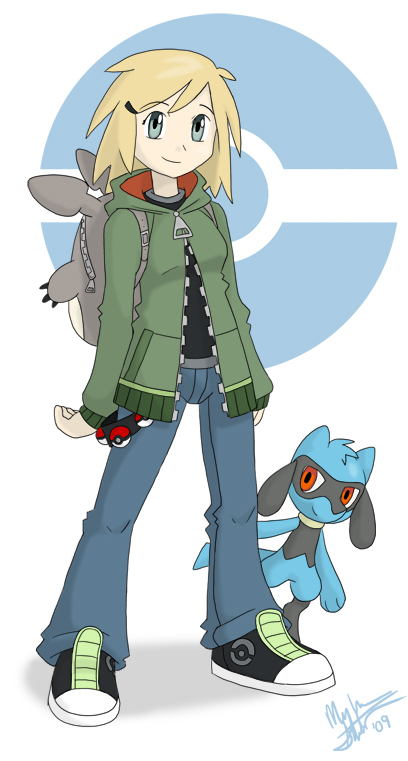 Finally, after she left Unova, she devoted her life to catch every Pokemon, and even if she never got as smart as some other people, she'll be able to learn about all Pokemon, and maybe even become a Pokemon Professor! After Unova, her parents got her a Squirtle egg. It hatched when she was finally ten, when she got her trainer licence. Now she is traveling through Kanto with her Squirtle, trying to catch every Pokemon. Personality: He is very playful, and can never spot moving and grooving! He is very energetic, and sometimes he can out speed some of the fastest Pokémon! He loves eating Poke puffs, especially an extremely sour one! Personality: A rather generous Pokemon who will try to best its self no matter what, the trainer will have his hands full with this Pokemon due to its restless nature, getting him to settle down is a great battle all on its own. When meeting new people Tyrouge is known to be rather shy and bashful. Wobbuffet isn’t one of the most intelligent pokemon; he acts a bit goofish, particularly around his trainer. What looks dangerous to others may seem trivial and entertaining to him, and what would seem harmless is like a death wish. You don't need to keep posting... There's an edit button... Also Pokemon can learn more than four moves. Please split the history into actual paragraphs, I can't read a giant block of text like that. I feel like it's odd that she would decide to start in Kanto when Unova's so new and seems like a grand and positive influence on her life. However, accepted regardless. I love what you've made and done with her!